Ultra Strong Chain + Padlock. Sold Secure Motorcycle Gold approved. 14mm Hex chain Ni-Cr-Mo alloy steel reinforced with Titanium. 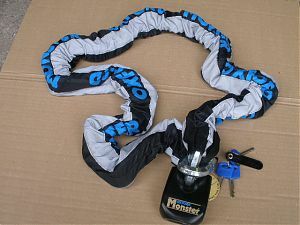 Cloth covered chain sleeve with reflective strip. Ultra strong padlock with hardened Boron steel armour casing.